So our second adventure with a FPGA begins… however I’ll not be providing a complete solution for you as I normally would, why? 😮 Well I kina see a VGA controller as a rite of passage for FGA skills. The first gotcha to avoid before even connecting your board is to connect it to the most capable video card you can, many of the newer monitors / cards / laptops and especially small TV’s with VGA ports can’t do the “traditional” VGA resolutions of yesteryear. 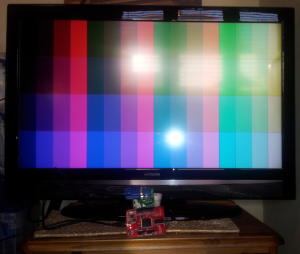 In the end I just plumped for 1680×1050 even TV’s that can’t quite manage it usually are able to down scan the signal, and although it won’t look the best at least it’ll work! What I’d suggest is that you count frames, given a 65hz or so frame rate if you count 32 or so frames and invert the state of led1 (make it a buffer signal not an output signal) then you’ll get a 1hz flash, which you can see by eye that you are roughly in the right ball park. The Front and Back Porch (htFP and htBP) are simply delays before and after the sync pulse. My first attempt wasn’t a great success I had a brain burp and thought it would be interesting “idea” to use a state machine to handle the timings and pattern generation – take it from me that’s an experiment that probably won’t make for an especially fulfilling experience. While on the subject of pulses a negative sync pulse is high when inactive and low when active, with a positive sync pulse being as you’d normally expect a signal. You’ll probably have a few false starts, a soupçon of frustration, and a whole bunch of smug satisfaction when you get it licked, I’ve also even given the horribly verbose nature of VHDL you should be able to produce a VGA pattern generator with less code that you thought! All devices should support 640×480@60 (25.175 MHz pixel clock). For some strange reason 720p and 1080p are very, very hard to find published timings for. I would have expected that it was all over the web!